Mr. & Mrs. Montell C. Ross Sr.
1. DAVID1 ROSS was born 1778 in Massachusetts, and died Unknown. He married HANNAH WESLEY. She was born 1782 in Maine, and died Unknown. 2.	i.	FREEMAN2 ROSS, b. October 09, 1821, Bloomfield Maine; d. March 11, 1901, Union Maine. 2. FREEMAN2 ROSS (DAVID1) was born October 09, 1821 in Bloomfield Maine, and died March 11, 1901 in Union Maine. He married ANGELIA WHEELER March 25, 1851 in St George Maine. She was born May 18, 1825 in St George Maine, and died March 17, 1910 in Union Maine. 3.	i.	CHARLES FREEMAN3 ROSS, b. September 21, 1858, New Sharon Maine; d. May 08, 1930, Union Maine. ii. FRANK ROSS, b. July 02, 1862, Warren Maine; d. February 27, 1900, Union Maine; m. CORA BATES, June 27, 1885, Oakland Maine; d. Unknown. iii. AUGUSTA ROSS, b. November 20, 1864, So Thomaston; d. Unknown. iv. ARDELLE ROSS, b. October 06, 1851, St George Maine; d. August 14, 1867, Lewiston Maine. v.	MARIE ROSS, b. August 15, 1853, New Sharon, Maine; d. January 15, 1879, Union Maine. 4.	vi. HATTIE ROSS, b. July 06, 1855, New Sharon; d. January 30, 1920, Union Maine. 3. CHARLES FREEMAN3 ROSS (FREEMAN2, DAVID1) was born September 21, 1858 in New Sharon Maine, and died May 08, 1930 in Union Maine. He married AUGUSTA BRYANT September 21, 1880 in Bristol, Me., daughter of LEVI BRYANT and ROXANNA JONES. She was born December 14, 1863 in Bristol Maine, and died Unknown. 5.	i.	MONTELL COTTLE4 ROSS, b. September 30, 1898, Union Maine; d. 1955.
ii. HARRY ROSS, b. October 07, 1881; d. August 1974, Union Maine; m. SADIE RICHARDS, September 18, 1906; d. Unknown. iii. ELDEN ROSS, b. March 23, 1883; d. July 18, 1885.
iv. ROXA ROSS, b. January 25, 1885; d. April 05, 1885. 6.	v.	LEON BRYANT ROSS SR., b. June 08, 1889; d. August 1974, Union Maine. vi. GLENWOOD ROSS, b. April 09, 1891; d. June 1985, Union Maine; m. LILLIAN MARTIN, June 29, 1914, Whitinsville Massachusetts; d. February 1945.
vii. PEARL ROSS, b. March 12, 1892; d. August 25, 1895. 7.	viii. EDWARD ROSS, b. July 09, 1895; d. Unknown. 8.	ix. MABEL ROSS, b. November 07, 1905; d. April 16, 2004, Waldoboro, Me..
x.	LEROY ROSS, b. December 02, 1887; d. February 16, 1940. 4. HATTIE3 ROSS (FREEMAN2, DAVID1) was born July 06, 1855 in New Sharon, and died January 30, 1920 in Union Maine. She married (1) ALENZA MORSE. He died Unknown. She married (2) ISAAC TIBBETTS July 10, 1871. He died 1878.
i.	HERBERT4 TIBBETTS, b. May 20, 1872; d. Unknown. 5. MONTELL COTTLE4 ROSS (CHARLES FREEMAN3, FREEMAN2, DAVID1) was born September 30, 1898 in Union Maine, and died 1955. 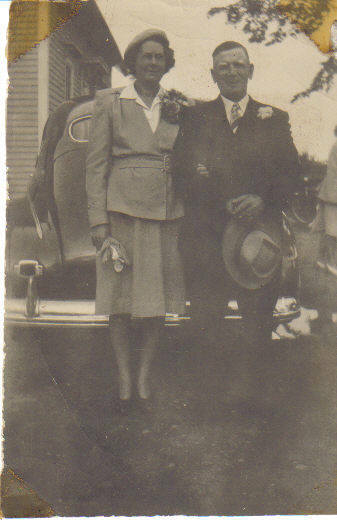 He married MILDRED A. JONES August 12, 1922 in Rockland Maine, daughter of WILLIAM JONES and FLORA GAMMON. She was born October 14, 1902 in Warren Maine, and died August 1974 in Waldoboro Maine. 9.	i.	MONTELL COTTLE ROSS5 JR., b. January 12, 1926, Warren Maine; d. March 11, 1971, Waldoboro Maine. 10.	ii. GEORGE BRYANT ROSS, b. February 19, 1923; d. September 1986. 11.	iii. FREDRICK LESTYN ROSS, b. January 23, 1924, Warren Maine; d. October 10, 2000, Damariscotta Maine. 12.	iv. DOUGLAS JOHN ROSS, b. Private. 13.	v.	EUNICE ROSS, b. Private. 14.	vi. DONALD CHARLES ROSS, b. Private. 6. LEON BRYANT ROSS4 SR. (CHARLES FREEMAN3 ROSS, FREEMAN2, DAVID1) was born June 08, 1889, and died August 1974 in Union Maine. He married (1) MYRA GRAY. She died Unknown in Vinalhaven Maine. He married (2) HAZEL BURNS October 19, 1915. She died Unknown. i.	ALICE MARGRETT5 ROSS, b. December 24, 1915; d. March 27, 2000.
ii. LEON BRYANT ROSS JR., b. May 26, 1917; d. 1918. 7. EDWARD4 ROSS (CHARLES FREEMAN3, FREEMAN2, DAVID1) was born July 09, 1895, and died Unknown. He married GRACE DAVIS March 08, 1917 in Union Maine. She died Unknown. i.	ERNEST CHARLES5 ROSS, b. April 23, 1919; d. 1945. 8. MABEL4 ROSS (CHARLES FREEMAN3, FREEMAN2, DAVID1) was born November 07, 1905, and died April 16, 2004 in Waldoboro, Me.. She married MARION SMITH October 29, 1921. He died 1979. 15.	i.	EDNA5 SMITH, b. Private. 16.	ii. ARTHUR SMITH, b. May 03, 1926; d. September 08, 1998. 9. MONTELL COTTLE ROSS5 JR. (MONTELL COTTLE4 ROSS, CHARLES FREEMAN3, FREEMAN2, DAVID1) was born January 12, 1926 in Warren Maine, and died March 11, 1971 in Waldoboro Maine. He married MADELINE ELIZABETH SIMMONS Private, daughter of PEARL SIMMONS and IDA SPRAGUE. She was born Private. 17.	i.	DANNY ANDREW6 ROSS, b. Private. 18.	ii. DEANNA LEE ROSS, b. Private. 19.	iii. MARK ALAN ROSS SR., b. Private. 20.	iv. NEAL ANTHONY ROSS SR., b. Private. 21.	v.	DEBORAH KAREN ROSS, b. Private. 22.	vi. MITCHELL PEARL ROSS, b. Private. 23.	vii. DEIDRE LYNN ROSS, b. Private. 24.	viii. TIMOTHY EDWARD ROSS, b. Private. 10. GEORGE BRYANT5 ROSS (MONTELL COTTLE4, CHARLES FREEMAN3, FREEMAN2, DAVID1) was born February 19, 1923, and died September 1986. He married NATLIE ACHORN Private. She was born Private. 25.	i.	WILLIAM B6 ROSS, b. Private. 26.	ii. BARBARA ROSS, b. Private. 27.	iii. GEORGIA M ROSS, b. Private. 28.	iv. LARRY DEAN ROSS, b. Private. 11. FREDRICK LESTYN5 ROSS (MONTELL COTTLE4, CHARLES FREEMAN3, FREEMAN2, DAVID1) was born January 23, 1924 in Warren Maine, and died October 10, 2000 in Damariscotta Maine. He married (1) BERTHA LEWIS June 20, 1948. She was born June 01, 1925, and died December 11, 1989. He married (2) SHIRLEY MILLER Private. She was born Private. 29.	i.	LEISA6 ROSS, b. Private. ii. MARSHA ROSS, b. Private. 12. DOUGLAS JOHN5 ROSS (MONTELL COTTLE4, CHARLES FREEMAN3, FREEMAN2, DAVID1) was born Private. He married (1) DOROTHY SPEAR Private. She was born Private. He married (2) ARLENE A. BURNS MANK Private. She was born Private. 30.	i.	RITA6 ROSS, b. Private. 13. EUNICE5 ROSS (MONTELL COTTLE4, CHARLES FREEMAN3, FREEMAN2, DAVID1) was born Private. She married FRANK FLAGG Private. He was born January 09, 1922, and died April 14, 1993. 31.	i.	BRENDA6 FLAGG, b. Private. 32.	ii. PAULA FLAGG, b. Private. 33.	iii. DARRYL R FLAGG, b. Private. 14. DONALD CHARLES5 ROSS (MONTELL COTTLE4, CHARLES FREEMAN3, FREEMAN2, DAVID1) was born Private. He married PATRICIA MARY MITCHELL Private. She was born Private. 34.	i.	TONYA HOLLY6 ROSS, b. Private. ii. SCOTT JAY MITCHELL ROSS, b. Private. 35.	iii. TRISHA DAWN ROSS, b. Private. 15. EDNA5 SMITH (MABEL4 ROSS, CHARLES FREEMAN3, FREEMAN2, DAVID1) was born Private. She married JAMES NELSON Private. He was born Private. 36.	i.	JAMES A.6 NELSON, b. June 09, 1946, Seattle, Wa; d. February 09, 1986.
ii. JEFFREY L. NELSON, b. December 28, 1954, Groton, Ct.; d. December 03, 1960. 16. ARTHUR5 SMITH (MABEL4 ROSS, CHARLES FREEMAN3, FREEMAN2, DAVID1) was born May 03, 1926, and died September 08, 1998. He married ANNE GEMEASKY Private. She was born Private. 37.	i.	GEORGE ARTHUR6 SMITH, b. Private. 38.	ii. LINDA ANN SMITH, b. Private. 39.	iii. BRIAN JAMES SMITH, b. Private. iv. BRUCE JOHN SMITH, b. Private; m. (1) BONNIE WARNER, Private; b. Private; m. (2) DEBORAH DUNNETT, Private; b. Private. 17. DANNY ANDREW6 ROSS (MONTELL COTTLE ROSS5 JR., MONTELL COTTLE4 ROSS, CHARLES FREEMAN3, FREEMAN2, DAVID1) was born Private. He married KAREN ANNE BLAKE Private, daughter of GORDAN BLAKE and SALLY JACOBS. She was born Private. i.	STEPHAN ANDREW7 ROSS, b. Private. 18. DEANNA LEE6 ROSS (MONTELL COTTLE ROSS5 JR., MONTELL COTTLE4 ROSS, CHARLES FREEMAN3, FREEMAN2, DAVID1) was born Private. She married (1) FREDRICK DOHERTY Private. He was born Private. She married (2) LUCIEN BERNIER Private. He was born Private. i.	ELIZABETH LEE7 DOHERTY, b. Private; m. DEAN R MURRAY, Private; b. Private. 40.	ii. RHONDA LOUISE DOHERTY, b. Private. 41.	iii. SHAWN ROBERT7 BERNIER, b. Private. 19. MARK ALAN ROSS6 SR. (MONTELL COTTLE ROSS5 JR., MONTELL COTTLE4 ROSS, CHARLES FREEMAN3, FREEMAN2, DAVID1) was born Private. He married (1) KAREN ANDERSON Private. She was born Private. He married (2) RONNER JENETTE LOBERG Private. She was born Private. i. MARK ALLEN ROSS7 JR., b. Private. ii. WAYNE ROSS, b. Private. iii. CAROLYN ELAINE ROSS, b. 1973; d. 1973. 42.	iv. RYAN7 ROSS, b. Private. 20. NEAL ANTHONY ROSS6 SR. (MONTELL COTTLE ROSS5 JR., MONTELL COTTLE4 ROSS, CHARLES FREEMAN3, FREEMAN2, DAVID1) was born Private. He married WENDY LEE JOHNSON Private. She was born Private. 43.	i.	AMY LEE7 ROSS, b. Private. 44.	ii. LYN RENEE ROSS, b. Private. iii. NEAL ANTHONY ROSS JR., b. Private; m. KAREN JEAN RAWLEY, Private; b. Private. iv. MONTELL COTTLE ROSS III, b. Private; m. MARY ELIZABETH BLAKE, Private; b. Private. 21. DEBORAH KAREN6 ROSS (MONTELL COTTLE ROSS5 JR., MONTELL COTTLE4 ROSS, CHARLES FREEMAN3, FREEMAN2, DAVID1) was born Private. She married HOWARD ANDREW SEVERSON SR. Private. He was born Private. 45.	i.	DWAYNE MATTHEW7 SEVERSON, b. Private. 46.	ii. MICHAEL ANDREW SEVERSON SR., b. Private. 47.	iii. HOWARD ANDREW SEVERSON JR., b. Private. 48.	iv. JESSICA JEAN SEVERSON, b. Private. 22. MITCHELL PEARL6 ROSS (MONTELL COTTLE ROSS5 JR., MONTELL COTTLE4 ROSS, CHARLES FREEMAN3, FREEMAN2, DAVID1) was born Private. He married VALETA MOORE Private, daughter of LESTER MOORE and DELIA BARTLETT. She was born Private. 49.	i.	RAQUEL DELIA7 ROSS, b. Private. ii. REAGAN DANIELLE ROSS, b. Private; m. JUSTIN GEORGE, Private; b. Private. iii. RENEE MICHELLE ROSS, b. Private. 23. DEIDRE LYNN6 ROSS (MONTELL COTTLE ROSS5 JR., MONTELL COTTLE4 ROSS, CHARLES FREEMAN3, FREEMAN2, DAVID1) was born Private. She married JOHN HENRY WAISANEN II Private. He was born Private. 50.	i.	JOHN HENRY7 WAISANEN III, b. Private. 51.	ii. JAROD HEATH WAISANEN, b. Private. 24. TIMOTHY EDWARD6 ROSS (MONTELL COTTLE ROSS5 JR., MONTELL COTTLE4 ROSS, CHARLES FREEMAN3, FREEMAN2, DAVID1) was born Private. He married (1) CHRISTINE CARLSON Private. She was born Private. He married (2) TINA RIDEOUT Private. She was born Private. 52.	i.	RITA LOUISE7 ROSS, b. Private. 25. WILLIAM B6 ROSS (GEORGE BRYANT5, MONTELL COTTLE4, CHARLES FREEMAN3, FREEMAN2, DAVID1) was born Private. He married DONA GIDNEY Private. She was born Private. 53.	i.	BRYAN7 ROSS, b. Private. 26. BARBARA6 ROSS (GEORGE BRYANT5, MONTELL COTTLE4, CHARLES FREEMAN3, FREEMAN2, DAVID1) was born Private. She married (1) THOMAS WRIGHT Private. He was born Private. She married (2) ROGER CARRIER Private. He was born Private. 54.	i.	LYNNE MARIE WRIGHT7 CARRIER, b. Private. 27. GEORGIA M6 ROSS (GEORGE BRYANT5, MONTELL COTTLE4, CHARLES FREEMAN3, FREEMAN2, DAVID1) was born Private. She married JAMES A HODGKINS Private. He was born Private. i.	BRIDGETTE A7 HODGKINS, b. Private. ii. DALE A HODGKINS, b. Private. 28. LARRY DEAN6 ROSS (GEORGE BRYANT5, MONTELL COTTLE4, CHARLES FREEMAN3, FREEMAN2, DAVID1) was born Private. He married (1) SALLY HARSHBARGER Private. She was born Private. He married (2) RHONDA RHODES Private. She was born Private. i.	IAN MONTGOMERY7 ROSS, b. Private. ii. AMIE LYNN7 ROSS, b. Private. iii. MANDY LEE ROSS, b. Private; m. ERIC WAYNE SMITH, Private; b. Private. 29. LEISA6 ROSS (FREDRICK LESTYN5, MONTELL COTTLE4, CHARLES FREEMAN3, FREEMAN2, DAVID1) was born Private. She married (1) M ROY MISHOU Private. He was born Private. She married (2) DONALD L PREBLE Private. He was born Private. i.	JENNIFER LYN7 MISHOU, b. Private. 30. RITA6 ROSS (DOUGLAS JOHN5, MONTELL COTTLE4, CHARLES FREEMAN3, FREEMAN2, DAVID1) was born Private. 55.	i.	DONNA7 POOLEY, b. Private. 31. BRENDA6 FLAGG (EUNICE5 ROSS, MONTELL COTTLE4, CHARLES FREEMAN3, FREEMAN2, DAVID1) was born Private. She married (1) JEFF S REYNOLDS Private. He was born Private. She married (2) TIMOTHY E HOLDEN Private. He was born Private. i.	CARRIE LYNN7 REYNOLDS, b. Private. 32. PAULA6 FLAGG (EUNICE5 ROSS, MONTELL COTTLE4, CHARLES FREEMAN3, FREEMAN2, DAVID1) was born Private. She married CHRISTOPHER ALLAN ROBERTS Private. He was born Private. i.	JOHN CHRISTOPHER7 ROBERTS, b. Private. ii. ALLAN ROSS ROBERTS, b. Private. 33. DARRYL R6 FLAGG (EUNICE5 ROSS, MONTELL COTTLE4, CHARLES FREEMAN3, FREEMAN2, DAVID1) was born Private. He married RHONDA L SHAW Private. She was born Private. i.	STEPHEN F7 FLAGG, b. Private. ii. JUSTINE A FLAGG, b. Private. 34. TONYA HOLLY6 ROSS (DONALD CHARLES5, MONTELL COTTLE4, CHARLES FREEMAN3, FREEMAN2, DAVID1) was born Private. She married (1) JAMES A GOODSON Private. He was born Private. She married (2) SCOTT MICHAEL PERRY Private. He was born Private. i.	MICHAEL JAMES7 GOODSON, b. Private; m. JOCELYN BOILARD, Private; b. Private. 56.	ii. MICHELLE AMBER GOODSON, b. Private. iii. BRANDON SCOTT7 PERRY, b. Private. 35. TRISHA DAWN6 ROSS (DONALD CHARLES5, MONTELL COTTLE4, CHARLES FREEMAN3, FREEMAN2, DAVID1) was born Private. She married (1) SHANNON BECULHIMER Private. He was born Private. She married (2) JAMES FOSTER Private. He was born Private. i.	MEGAN VIRGINIA7 FOSTER, b. Private. ii. NICOLE ALLISON FOSTER, b. Private. 36. JAMES A.6 NELSON (EDNA5 SMITH, MABEL4 ROSS, CHARLES FREEMAN3, FREEMAN2, DAVID1) was born June 09, 1946 in Seattle, Wa, and died February 09, 1986. He married NANCY PIERCE Private. She was born Private. i.	KEITH7 NELSON, b. Private; m. VICKI MASCAR, Private; b. Private. ii. KYLE NELSON, b. Private. 37. GEORGE ARTHUR6 SMITH (ARTHUR5, MABEL4 ROSS, CHARLES FREEMAN3, FREEMAN2, DAVID1) was born Private. He married PHILLIS ANDERSON Private. She was born Private. i.	CHRISTINE7 SMITH, b. Private. 38. LINDA ANN6 SMITH (ARTHUR5, MABEL4 ROSS, CHARLES FREEMAN3, FREEMAN2, DAVID1) was born Private. She married DENNIS W ORANGE Private. He was born Private. i.	MATTHEW ARTHUR7 ORANGE, b. Private. ii. PATRICK WILLIAM ORANGE, b. Private. 39. BRIAN JAMES6 SMITH (ARTHUR5, MABEL4 ROSS, CHARLES FREEMAN3, FREEMAN2, DAVID1) was born Private. He married LINDA HOFFMAN Private. She was born Private. i.	LARNA ROSS7 SMITH, b. Private. ii. MICHAEL BRIAN SMITH, b. Private. 40. RHONDA LOUISE7 DOHERTY (DEANNA LEE6 ROSS, MONTELL COTTLE ROSS5 JR., MONTELL COTTLE4 ROSS, CHARLES FREEMAN3, FREEMAN2, DAVID1) was born Private. She married (1) THOMAS CHASE Private. He was born Private. i.	JORDAN8 CHASE, b. October 23, 1991, Lewiston Maine; d. February 20, 2011, Columbia SC. ii. TARA CHASE, b. Private. iii. ASHLEY CHASE, b. Private. iv. NICHOLAS8 DOHERTY, b. Private. 41. SHAWN ROBERT7 BERNIER (DEANNA LEE6 ROSS, MONTELL COTTLE ROSS5 JR., MONTELL COTTLE4 ROSS, CHARLES FREEMAN3, FREEMAN2, DAVID1) was born Private. He married (1) ALAYNE MORRIS Private. She was born Private. He married (2) SANDY HAIRFIELD Private. She was born Private. i.	VIRGINIA8 BERNIER, b. Private. ii. SARAH BERNIER, b. Private. 42. RYAN7 ROSS (MARK ALAN ROSS6 SR., MONTELL COTTLE ROSS5 JR., MONTELL COTTLE4 ROSS, CHARLES FREEMAN3, FREEMAN2, DAVID1) was born Private. He married HOLLY MULLINS Private. She was born Private. i.	LYDIA MADDISON8 ROSS, b. Private. 43. AMY LEE7 ROSS (NEAL ANTHONY ROSS6 SR., MONTELL COTTLE ROSS5 JR., MONTELL COTTLE4 ROSS, CHARLES FREEMAN3, FREEMAN2, DAVID1) was born Private. She married SCOTT LINCOLN BRAMHALL Private. He was born Private. i.	CURTIS ALAN8 BRAMHALL, b. Private. ii. ERIKA JANE BRAMHALL, b. Private. 44. LYN RENEE7 ROSS (NEAL ANTHONY ROSS6 SR., MONTELL COTTLE ROSS5 JR., MONTELL COTTLE4 ROSS, CHARLES FREEMAN3, FREEMAN2, DAVID1) was born Private. She married MICAH GARY HALL Private. He was born Private. i.	JASMINE RENEE8 HALL, b. Private. 45. DWAYNE MATTHEW7 SEVERSON (DEBORAH KAREN6 ROSS, MONTELL COTTLE ROSS5 JR., MONTELL COTTLE4 ROSS, CHARLES FREEMAN3, FREEMAN2, DAVID1) was born Private. He married DESI-RAE MASON Private. She was born Private. i.	LUCY8 SEVERSON, b. Private. 46. MICHAEL ANDREW SEVERSON7 SR. (DEBORAH KAREN6 ROSS, MONTELL COTTLE ROSS5 JR., MONTELL COTTLE4 ROSS, CHARLES FREEMAN3, FREEMAN2, DAVID1) was born Private. He married (1) JENNIFER VEILLETTE Private. She was born Private. He married (2) SARAH HATHAWAY Private. She was born Private. He married (3) CHRISTINA Private. She was born Private. i.	CODY ALLEN-MICHAEL8 SEVERSON, b. Private. ii. KYARA LEE-ANA SEVERSON, b. Private. iii. MICHAEL ANDREW SEVERSON JR., b. Private. iv. ADRIANA8 SEVERSON, b. Private. 47. HOWARD ANDREW SEVERSON7 JR. (DEBORAH KAREN6 ROSS, MONTELL COTTLE ROSS5 JR., MONTELL COTTLE4 ROSS, CHARLES FREEMAN3, FREEMAN2, DAVID1) was born Private. He married HILARY STEELE Private. She was born Private. i.	JACOBY JAMES8 SEVERSON, b. Private. ii. KASEN ANDREW SEVERSON, b. Private. 48. JESSICA JEAN7 SEVERSON (DEBORAH KAREN6 ROSS, MONTELL COTTLE ROSS5 JR., MONTELL COTTLE4 ROSS, CHARLES FREEMAN3, FREEMAN2, DAVID1) was born Private. She married DOUGLAS HORACE ANDERSON Private. He was born Private. i.	TRINITY BROOKLYN8 ANDERSON, b. Private. 49. RAQUEL DELIA7 ROSS (MITCHELL PEARL6, MONTELL COTTLE ROSS5 JR., MONTELL COTTLE4 ROSS, CHARLES FREEMAN3, FREEMAN2, DAVID1) was born Private. She married ROB GOODRICH Private. He was born Private. i.	KYLIE DELIA8 GOODRICH, b. Private. 50. JOHN HENRY7 WAISANEN III (DEIDRE LYNN6 ROSS, MONTELL COTTLE ROSS5 JR., MONTELL COTTLE4 ROSS, CHARLES FREEMAN3, FREEMAN2, DAVID1) was born Private. He married NAOMAH TIMMERMAN Private. She was born Private. i.	ALEXIS ALCADA8 WAISANEN, b. Private. ii. LILY RAYE WAISANEN, b. Private. 51. JAROD HEATH7 WAISANEN (DEIDRE LYNN6 ROSS, MONTELL COTTLE ROSS5 JR., MONTELL COTTLE4 ROSS, CHARLES FREEMAN3, FREEMAN2, DAVID1) was born Private. He married FAITH BERUBE Private. She was born Private. i.	KIRSI LYN8 WAISANEN, b. Private. 52. RITA LOUISE7 ROSS (TIMOTHY EDWARD6, MONTELL COTTLE ROSS5 JR., MONTELL COTTLE4 ROSS, CHARLES FREEMAN3, FREEMAN2, DAVID1) was born Private. She married RICHARD BLANC Private. He was born Private. i.	ABRAHAM ERVINE8 BLANC, b. Private. 53. BRYAN7 ROSS (WILLIAM B6, GEORGE BRYANT5, MONTELL COTTLE4, CHARLES FREEMAN3, FREEMAN2, DAVID1) was born Private. He married ANGELA JAMISON Private. She was born Private. i.	LEXXUS MARIE STAPLES-JAMISON8 ROSS, b. Private. ii. MORGAN KYLIE ROSS, b. Private. 54. LYNNE MARIE WRIGHT7 CARRIER (BARBARA6 ROSS, GEORGE BRYANT5, MONTELL COTTLE4, CHARLES FREEMAN3, FREEMAN2, DAVID1) was born Private. She married ROBERT PLOURDE Private. He was born Private. i.	BAILEY ANN8 PLOURDE, b. Private. 55. DONNA7 POOLEY (RITA6 ROSS, DOUGLAS JOHN5, MONTELL COTTLE4, CHARLES FREEMAN3, FREEMAN2, DAVID1) was born Private. She married WALTER NICHOLS Private. He was born Private. i.	JASMINE ROSE8 NICHOLS, b. Private. 56. MICHELLE AMBER7 GOODSON (TONYA HOLLY6 ROSS, DONALD CHARLES5, MONTELL COTTLE4, CHARLES FREEMAN3, FREEMAN2, DAVID1) was born Private. She married JAMES WALTER GREER Private. He was born Private. i.	RASHONDA LEANN8 GREER, b. Private. ii. HUNTER WILLIAM GREER, b. Private. iii. JAMEY JEAN GREER, b. Private. iv. TRAVIS MARK GREER, b. Private.
. Jones Genealogy Page . Ross Genealogy Page Sprague Genealogy Page . Simmons Genealogy Page .